Whether you follow fashion trends or not, spring is a time when a lot of us find the need to shop for some new clothes. When I shop, my first stop is always a second hand store. In LA, I really like Wasteland and Crossroads Trading Company. If I can’t find what I need at a second hand store, my next choice is finding the most eco company I can that makes what I need. When I was pregnant, my girlfriends shared with me their old maternity clothes, and gave me hand-me-down clothes for Bear. For my baby shower I asked people to bring stuff their kids had grown out of instead of buying new stuff. Two friends who have boys gave me most of the clothes Bear wears. As he has grown, I’ve passed these clothes along and it feels really great. I remember having tons of hand-me-downs when I was little too. Yay, mom! A great idea is to ask around and see if your friends are interested in getting together for a clothing swap party. The way it works is everyone brings all the clothes they no longer need –clothes they would have donated or given away. Set up all the clothes in your living room, and start “shopping.” Try things on, take pictures, have fun! You can draw numbers and take turns or just make it a free for all. Serve kind snacks, or make it a potluck. I know of someone who does this with her girlfriends every year on Super Bowl Sunday – she calls it Lady Bowl. Sounds so fun! 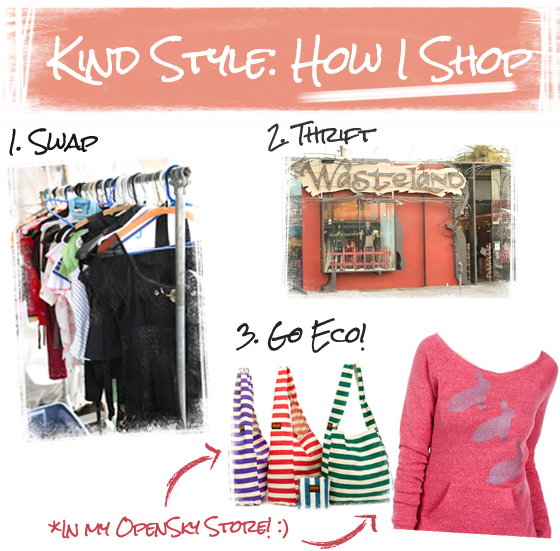 What are your eco-shopping tips?